SXSW is right around the corner, which means celebs are sure to be in abundance during the film portion of the fest. The organizers of the 20th SXSW Film Conference and Festival have made sure things kick off with a ton of fanfare by lining up the world premiere of The Incredible Burt Wonderstone on opening night. The Incredible Burt Wonderstone is a star-studded comedy directed by Don Scardino who’s other credits include a lot of high-profile TV shows like 30 Rock, Law & Order and 2 Broke Girls. Scardino is breaking away from his comfort medium of television to take on the big screen – something he hasn’t done in well over a decade. 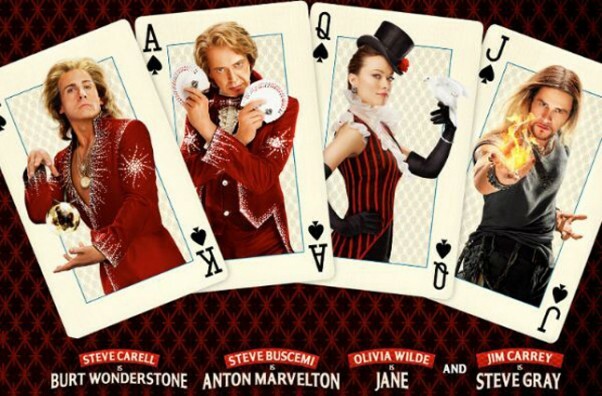 The cast list includes two great Steves in starring roles, Steve Carell who plays the title character and Steve Buscemi as Wonderstone’s magic act partner. Jim Carrey plays a nemesis with luscious long locks, which should be fantastic in more ways than one. Rounding out the cast is Olivia Wilde (who seems to be in just about every movie these days), Alan Arkin and James Gandolfini. David Copperfield even makes an appearance as himself. The story follows Wonderstone, a marquee Vegas magician, as he tries to recover from losing his thunder to magical street performer Steve Gray (Carrey). Along the way Wonderstone tries to salvage his faltering friendship with his magic act co-magician, befriends his elderly magic mentor and meets a girl with a few tricks up her sleeve. The screenplay was written by Jonathan M. Goldstein and John Francis Daley. The duo has teamed up in the past on the successful comedy Horrible Bosses in addition to a few others. The script was based off a story by Chad Kultgen, Daley and Goldstein. Judd Apatow fans may remember Daley from his stint as Sam Weir on the tragically short-lived Freaks and Geeks. The trailer for The Incredible Burt Wonderstone is now available on the inter-web for your viewing pleasure. Make sure you don’t miss a minute of the premiere, book your reservation with Royal Executive Transportation and enjoy stress free SXSW transportation!